Figure I ought to get with the times and take a look at one of these Rebirth books that are all the rage these days! Let's see if it lives up to the hype... wait, whattayamean wrong Rebirth??? Clark Kent has been suffering from recurring nightmares concerning the destruction of his home planet, Krypton. He awakens from his dream just as Krypton explodes. He decides this has gone on for far too long, and figures he may find the answers he seeks at the Fortress of Solitude. At the Fortress, Superman decides to use his Mind-Prober Ray to see if he can dig a bit deeper into his subconscious. Under the pink light of the probe, Superman's memory begins filling in bit by bit. He comes across a stray memory wherein his parents hooked a mind-linking device between the three of them before shipping him Earthward. This is not the Man of Steel origin... no "birthing matrix" here, Kal-El was born on Krypton. Now with perhaps more questions than answers... Superman needs to get to the bottom of the mind-link. What was the purpose? He hooks himself up to a diagnostic machine and finds three sets of brainwaves in his head... presumably his own, as well as Jor-El and Lara's. Now how can he access them? The following week, Clark introduces his birth parents to his co-workers at the Galaxy Building. Lois, Jimmy, and Perry meet Jordan and Lora Elsworth... and are surprised to see their old pal Clark so happy. After leaving, the three Kryptonians shed their civvies and fly off in their Super-gear. Superman gives them a bit of a guided tour of the Earth, including sightseeing the Statue of Liberty and the Pyramids. At this point, Superman struggles to fight off some nagging doubts he has about his "parents"... he expects the other shoe to eventually drop... but decides to just enjoy the moment. On their way back to the Fortress, the El family even gets a bit of hero-ing time when they save a pair of hot air balloon enthusiasts. Back at the Fortress, Jor-El and Lara look at some of Kal's Kryptonian artifacts and mourn the destruction of their home. The scientifically-curious Jor-El meanders over to some of Kal's tech... including a(n apparently two-way) view-screen into the Phantom Zone. Superman reaches to shut off the projector, but Jor-El stops him. Superman finds himself about to enter battle with his "parents"... who absolutely wipe the floor with him. After the fight, "Jor-El" ties Superman to the Kryptonian rocket ship that delivered him to Earth in the first place. His plan is to ignite the Kryptonian fuel... and blast the ship off Metropolis way. The entire fight was being viewed by a pair of shadowy outsiders, who appear to be quite pleased. With Superman having been launched, we find that the pair of outsiders are a couple of bet-crazy aliens called Rokk and Sorban. Much to their surprise, Superman comes bursting through their ship! Superman clearly ain't a happy camper, and he demands to know what's going on. Not wanting a fight, the geeks spill the beans. 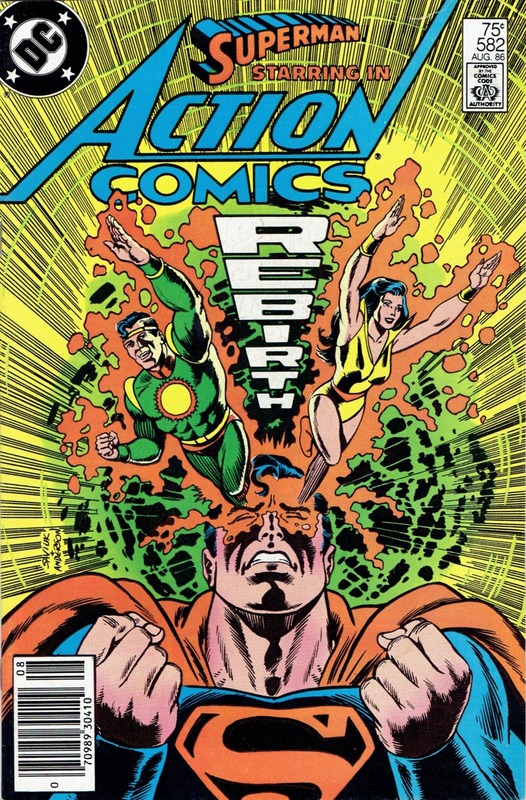 Ya see, they planted the bad dreams and the extra "brain waves" into Kal's head... they wanted to see if they could drive Superman to the point at which he'd commit murder. They had a wager between them, and figured the best way to truly test Supes' code was by messing with his parents. Superman decides the best punishment he can dish out is bringing them to a Prison Asteroid. On his way back to Earth, he recounts how he maneuvered outta this jam. Turns out, the "Kryptonian rocket" was just a facsimile he'd made... and it contained Earth fuel, which Superman could easily withstand. Before taking out Rokk and Sorban, he knocked his impostor parents into the time stream... by flying around them really really fast. We close out this tale with Superman sitting at the feet of the Jor-El and Lara statues at the Fortress mourning their loss, yet not completely letting go of hope. Exhausted from his recent bout of nightmares, Superman falls asleep in the shadow of his parents. Okay, okay... we all know this isn't quite the Rebirth one thinks of these days, however, it was a neat hook for me to share this fun little (extremely late) pre-Crisis era Superman story. This is an interesting way to wrap up an era of Superman... the issue immediately following this one is the second half of Whatever Happened to the Man of Tomorrow?... 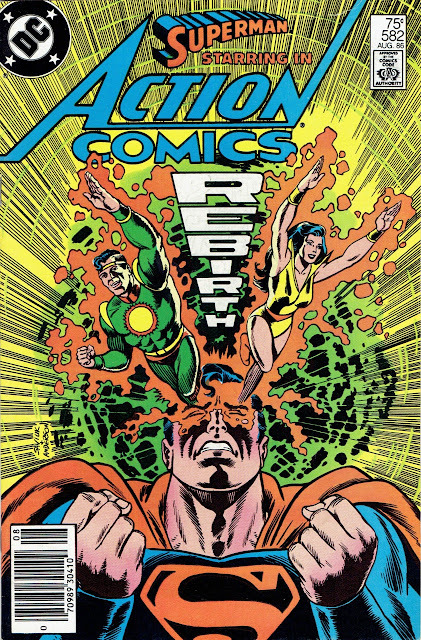 so this is kind of the final "regular" issue of Action Comics before the Byrne/Man of Steel reboot. I'm not familiar with the works of Craig Boldman, however, I really enjoyed this one. He leaves a note in the letters column (below) thanking DC for the opportunity to work on the Superman books... I'll have to see if I have any more of his stuff in my collection. Alex Saviuk's art is, as always, very nice. I usually associate him with Spider-Man books, but it is a real treat to see him take on Superman. This had all the makings of the ol' "imaginary story", what with the El's coming back from the dead and all... I'm glad it wasn't, as I enjoyed seeing Superman's true reaction(s) to both finding and losing his real parents. It all felt very real... and Superman felt very human in the final panels. He recognizes that he may have ignored his critical thinking with the small glimmer of hope he saw... and he mourns their passing at the foot of the statues he'd erected at the Fortress until he falls asleep. A sad... but fitting end (almost the end of the entire era!). I gotta admit, I'm glad I grew up in the post-Crisis era! haha, not gonna lie... I'm glad I did too! But these stories are a fun little visit from time to time.